Using an RV and retiring go together like peanut butter and jelly. Why shouldn’t you go on an adventure and save some money while you’re at it? 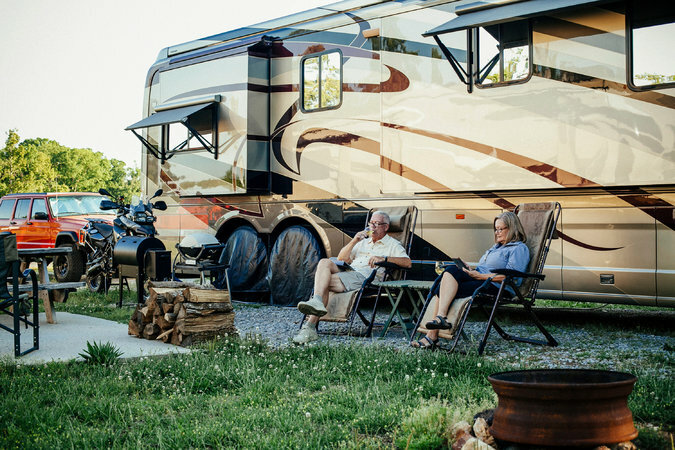 There are countless reasons to start living in a recreational vehicle once you’ve retired, and we’ve decided to point out several of them. Just make sure that you choose the right vehicle for your needs and select the key features that matter the most to you. For instance, some people might not be able to live without a TV, while others simply don’t find it appealing or necessary. Let’s look at some of the details one should consider when buying an RV after getting retired. Why get an RV for retirement in the first place? Most people out there dream about traveling for as much as they can. Yet traveling is expensive. RVs give you the opportunity to avoid paying for expensive accommodation and for expensive transportation. Living small is a happy experience. Downsizing can be difficult for some individuals, but it basically means that you’ll finally get rid of all that clutter you haven’t been using for years anyway. In addition, living in an RV can assist with downshifting one’s lifestyle. If you’re planning to retire early, you should have some backup plan that can help you with the next thirty years or so. RVs are affordable enough so that you don’t maintain a yard, pay a lot of money on house work. In fact, RVs are relatively easy to cool and heat. Some people say that purchasing a used RV is the best idea. Others claim that buying new is the only reasonable way to go about things. The fact of the matter is you should you what’s best for you. If you have little to no experience when it comes to inspecting a car or an RV, you should ask the opinion of a mechanic, particularly if you want to get a used unit. In a way, second-hand RVs are advantageous because they are more affordable than new alternatives. Depreciation is a major cause of the lower prices of used vehicles, which is what you should consider if you eventually desire to sell your RV. Aside from deciding on new or used, you should consider the dealer. Some of the features you might have a look at are the generator, the inverter, the fridge, the microwave, the awning, and the tires. What type of RV should you get? There are many kinds of RVs and campers on the market today, but they can mostly be split up into motorhomes and tow-behind 5th wheel/travel trailer. With the first, you’ll be driving your own home everywhere, but you won’t have the versatility of a small car. Trailers are more affordable and thanks to them, buyers have the freedom to leave them at the trailer park and go on grocery shopping with their cars. In the end, owning an RV while being retired is a good idea for a wide array of reasons. You might be able to visit family and friends who you haven’t seen for years. Perhaps your children are living in another state and you’d like to spend more time with them. If you choose a roomy enough model, you might even have enough space for a pet, such as a cat or a small dog. RVs can simplify your life, so why not just give in to the call of the open road?